Happy Tuesday and welcome to the #ToddlerApprovedTuesday linky party and community. Are you enjoying this lovely autumn weather we’ve been having? It’s been so mild here recently that we’ve been enjoying lots of outside and water play today despite it being October! This week we made our favourite Halloween craft – Pumpkin Suncatchers. We make these every year. They’re so easy and my Little Tots love them. My co-host Becky from 3 Princessess and 1 Dude has been reviewing The Little Elephant Who Wants To Fall Asleep book, find out if it helped her monsters fall asleep here! Thank you to everyone who linked up last week. My favourite from Instagram was this one from Kate at Along Came Poppy. My favourite linked up post were these Fajizzas from the Kids Make and Bake Club. A perfect after school snack. 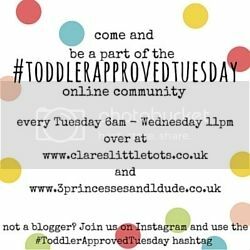 Add the #ToddlerApprovedTuesday badge on each post you would like to link up. Share the comment love – lets aim to comment on at least one of the hosts and the post before yours. Tweet us your link (@clarestots and @3princess_1dude) for a Retweet. If your post has a pin friendly image I will pin to the #ToddlerApprovedTuesday Pinterest board. and don’t forget to add #ToddlerApprovedTuesday to your instagram posts to show us what you’ve been up to.